Add up to 25 HP! 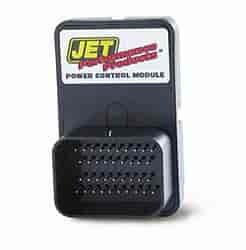 The JET Performance PCM provides the same type of Power Tuning as a JET Performance chip and is the most sophisticated tuning device for late model Chrysler/Dodge/Jeep vehicles available today. The JET PCM is a 20Mhz RISC computer that controls air/fuel, ignition advance, and transmission tuning for the ultimate in power gains. Stage 1 is for stock or mildly modified vehicles. Fuel and timing curves are modified for optimal performance and mileage using less expensive, lower octane fuels. Programming is designed to burn fuel at peak efficiency, which results in improved performance and mileage. Daily drivers can use lower cost regular fuel for potential mileage gains but, for optimal performance gains, use of mid-grade or better is recommended. Does JET Performance 90402 fit your vehicle?